Pickup Some Creativity: What do you want to be when you grow up? This simple-seeming question can have life-altering implications. When my own daughter has been asked this, her reply has been "to be a baker". Which is great. Really. But how often does your daughter reply, "I want to be a mother." To this end, I have been working on pretend playthings that will help my girls develop their maternal side. I was blessed to have parents who provided playthings that allowed me to pretend to be a mommy. I want to do the same thing for my girls. 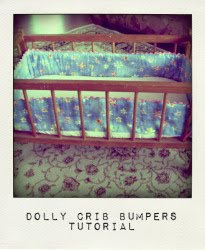 I've given my girls the doll sized crib that was mine when I was little, and it was in need of a makeover. 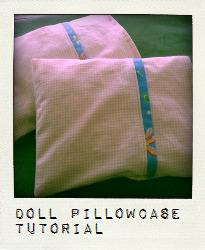 For the next two weeks, I'll share tutorials on how to make dolly-size bedding. 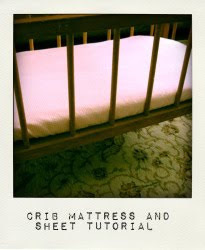 Every measurement will be given in proportions, so no matter what size crib you have--a toy size or full size--you can apply these techniques. Featured on Lily & Thistle. 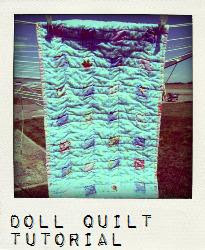 Linking up to The Girl Creative, Sew Can Do, Mad in Crafts, and Tea Rose Home. Hi Chris! I'm excited to tell you that you won our little giveaway on "bee in our bonnet!" If you could email me your address, I will send that to you ASAP! I hope you have fun with it. I AM excited to learn how to make some wonderful toys for my daughter! Thanks for sharing! Wonderful! I love this idea and can't wait to see the results! I wish you lived closer to me. I'm sure we'd be friends. Oh how funny!! I just stopped over from Noodlehead and was browsing your doll tutorials (I just picked up a little doll crib at a local thrift store and am sewing bedding for my soon to be 3 yr old's bday). And that picture of your little one asleep in the doll crib made me laugh out loud!! It's so cute and reminded me so much of all the goofy places my kids have fallen asleep! Your doll items are so precious.